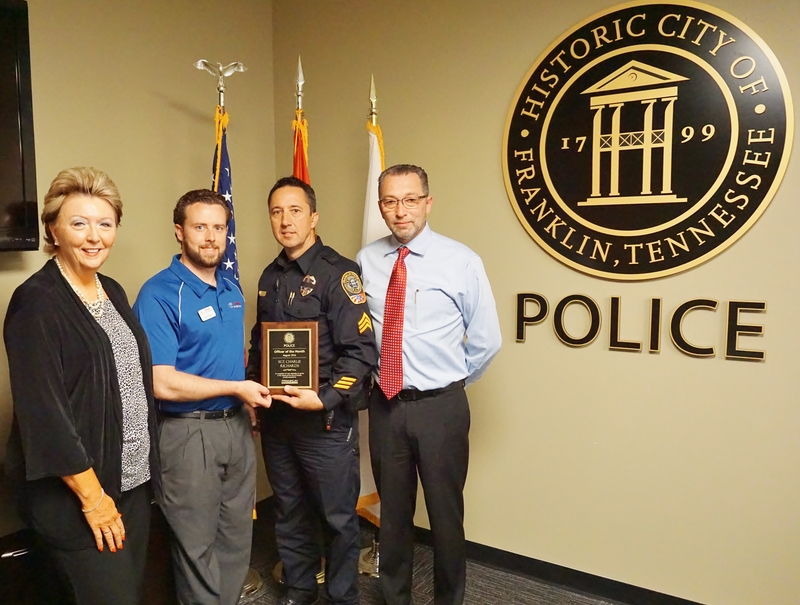 Franklin Police Sergeant Charlie Richards has been named Officer of the Month. The honor follows his work to help a homeless, United States Veteran who was exploited by a thief and left with nothing but the clothes on his back. While working the midnight shift, Sergeant Richards stopped to check on a man asleep on a Franklin park bench. During their conversation, Sergeant Richards learned that the man had walked to Franklin after the backpack containing everything he owned was stolen from him in Nashville. During their conversation, Sergeant Richards confirmed that the man had no warrants and that he was not suspected of any crimes. Sergeant Richards, however, did not arrest the man for loitering in the park after-hours … or simply tell him to move along. Having a good feel for the man’s motives and heart, the Sergeant enlisted the help of local clergy and arranged for a hot meal and an overnight stay at a Franklin motel. What happened next is what prompted Chief Deborah Faulkner to select Richards as the Department’s Officer of the Month. Toyota – Cool Springs and Franklin Chrysler, Dodge, Jeep, Ram are proud sponsors of the Department’s Officer of the Month Program. Each month they honor a Franklin Police Officer with a commemorative plaque and a $150 check for the officer to donate to the charity of their choice. Sergeant Richards is donating the money to his favorite charity: Community Outreach Ministries, a Franklin organization that offers help, hope, and healing to the tired, bruised, wounded, broken and sometimes invisible and forgotten of our community.